OUR GUARANTEE – All Coutale Sommelier corkscrews are backed by a lifetime guarantee. We stand by our product as the ONLY French Patented spring-loaded double lever and the most aesthetic and utilitarian double-lever waiter’s corkscrew on the market. All Coutale Sommelier corkscrews are backed by a lifetime satisfaction guarantee. Message us through Amazon with any questions you may have and we promise to always answer within 24 hours. FRENCH PATENTED SPRING-LOADED DOUBLE LEVER - The Coutale Sommelier range of corkscrews are the ONLY range of patented spring-loaded double lever corkscrews on the market. 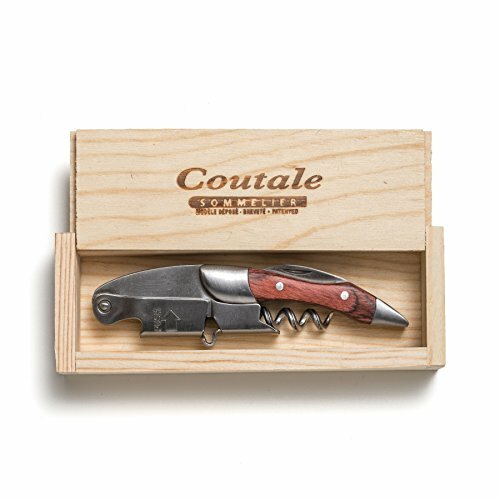 Patented by Philip Bernède, French winemaker and owner of Clos La Coutale winery in Cahors, France, The Prestige by Coutale Sommelier is Coutale Sommelier's most premium model; The only French-designed and Patented corkscrew is the Coutale Sommelier brand. FRAME AND HANDLE IN SOLID STAINLESS STEEL - Our Prestige Rosewood by Coutale Sommelier is built on a base of Solid Stainless Steel. From here, a slab of hand-cut Rosewood is affixed to the frame via stainless steel rivets. The end product? A corkscrew that is as aesthetically gorgeous as it is useful. Made of practical lines, The Prestige Rosewood by Coutale Sommelier is as comfortable opening 100's of bottles a night as it is on display at home. STAINLESS STEEL GROOVED WORM - The Prestige line of corkscrews by Coutale Sommelier features a stainless steel grooved worm. Not only is the worm gorgeous - crafted from a single piece of stainless steel - but furthermore it is practical. The groove in the worm creates friction between the cork and the worm, allowing for greater tension and a smoother cork pull. STAINLESS STEEL SERRATED KNIFE - The Prestige line of corkscrews comes equipped with a Stainless Steel Serrated Knife. Unlike the dull standard-issue knives on most corkscrews our Stainless Steel Serrated knife cleanly cuts the foil, allowing for an even cut across the foil and a clean removal. No more torn foils with the Prestige by Coutale Sommelier. COUTALE SOMMELIER PINE WOOD CRATE - Reminiscent of wooden wine crates the Prestige Rosewood comes packaged in a crate equal in sophistication. French-designed and made in California of sustainable pine wood the Coutale Sommelier Crate is finished with a hot stamp that bears its trademark name - an homage to both the California and French wine countries.